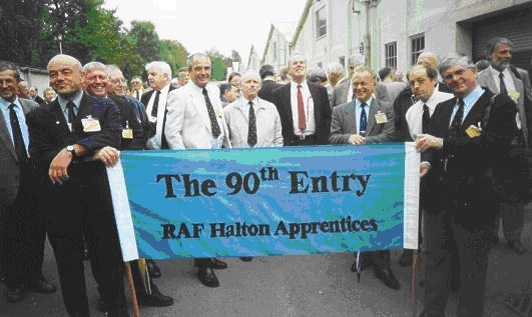 The 90th Entry Society was founded by Sam Weller in 1985, and it is affiliated to the RAF Halton Aircraft Apprentices Association (RAFHAAA). Sam was, until November 2009, running the whole Society and all of its activities on his own, hugely aided by his memsahib, Jane. Increasing problems with his eyesight forced Sam to reduce his Societal activities and a Committee was formed to take over the running of the Society, with Bob Heyhoe working as Chairman and Keith Tippey creating and maintaining this 90th Entry Web Site. Croc also has the duty of being the 90th Entry Bard, and regales us with his Odd Odes on special occasions. Special occasion are reported in Despatches that are available to 'members only' in the Archives. The main aims of the Society have always been to allow 90th Brats to meet up, either by post, electronically or at Reunions and other Gatherings, and to provide a forum for discussions of Halton Days, subsequent Service careers, and general aeronautical matters. The primary written forum is the Society’s monthly Newsmagazine, The 90th Despatches, and the current issue now appears on the Web Site, with back issues in the Archives. We also post urgent Announcements through 90th Notes, sent by e-mail (at least one per month). 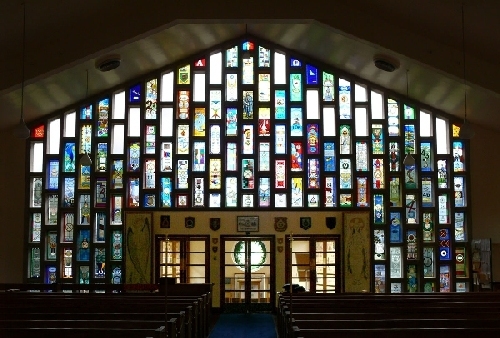 For our 50th Anniversary year, Sam created a 90th Entry stained glass window which is installed in the Garrison Church at Halton, together with the commemorative windows of most Entries. Our Members paid for this and also contributed towards creating another window, commemorating the namesake of our Wing at Halton, General Sir David Henderson. We have also commemorated our Entry in the RAF Halton Grove at The National Arboretum. We produced an Entry Banner for use on parades at Halton and elsewhere, and more recently had presented to us our original banner produced in 1959 and this has now been refurbished and used for several reunions and on parade at Halton. We have also made large-scale donations to various military charities. These have all been paid for, as have wreaths or charity donations for Members who have passed away, out of The 90th Entry Fund. This Fund was set up originally, by the then-existing Members paying £50 each to cover the costs of the 90th Entry Window, shown here, but we have continued to accept similar donations, on a one-off, voluntary basis, from new Members, so that all Members have the opportunity of feeling that they have contributed towards everything which the Entry has done which needed funding. We have also raised lots of money through auctions and raffles at Meetings. If you wish to donate to this Fund, at a financially convenient time for you, please make your cheques payable to “The 90th Entry Fund”. To facilitate a rapid approval of other, occasional payments, which are always for the benefit of all Members, we ask for Members who may disagree with any requested Fund payments to e-mail or telephone the Chairman ASAP after receiving the proposal, and we assume that all others have accepted the proposal. A simple majority decides. It should be noted that all of our social functions are totally self-financing, with no drain on The Entry Fund. All payments to the society should be posted to the Treasurer. Please email the treasurer for the currnet address. It is appreciated that many Members have other important commitments, and so it is stressed that this is very much an “Opt In” Society. It should be noted that The Ladies are always welcomed at all of our functions, and they do all seem to enjoy themselves. There is a great deal on offer and we hope that you will participate, but the choice is entirely yours. We do, however, request one duty for all: if you change your snail-mail and/or e-mail address, please let the Membership Secretary know as soon as possible. If you do not receive any mailings from the Society at least once a quarter, then do get in contact, as something has gone wrong somewhere, as there will be at least one e-mailing per quarter to let you know when the Web Site has been updated!